Our smart phones are so smart. And our homes are getting smarter. In our home we’ve had smart TVs forever, and recently, we added a smart home assistant—Amazon’s Alexa! I was skeptical at first (I never really got into phone assistants like Siri because I felt like I could just type or swipe quicker lol), but with a home assistant, I’m hooked. We have an Echo in our living room and an Echo Dot in our bedroom, so Alexa is hanging out in two key areas of the house. I love my Amazon Echo / Alexa! News, weather, shopping lists, and probably our key use for the home assistant—playing music, is just one ‘Alexa?’ away. It’s pretty cool to be able to get news highlights read to me as I feed the animals in the morning, or blast Backstreet Boys while I’m washing the dishes (does anyone else listen to BSB every day? Just me?). There are times when Alexa doesn’t understand our questions, or doesn’t properly hear our questions, and that can be frustrating (she always apologizes for not knowing though lol). 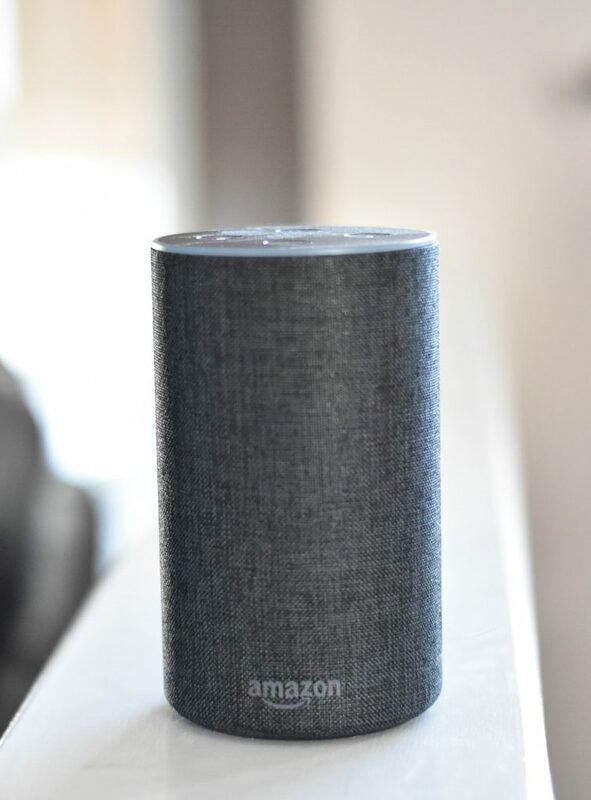 But overall, Mike and I love having the Amazon Echo (Alexa) home assistant, and are excited about the possibilities of this type of technology. Below are a list of some of our favourite Alexa Skills! Keep scrollin’ down to enter for a chance to win your own Amazon Echo, courtesy of TELUS! Remember, I’m a #TeamTELUS ambassador this year so I get to write about and give away some cool TELUS stuff for readers! You can set up Alexa to a bunch of news sites. Ours is set to CBC News. It’s a great way to get some quick headlines that still includes a bit more context (with interview clips) while you’re doing other things. I see the cat food is running low, I say ‘Alexa, add cat food.’ I remember we’re almost out of toilet paper, I say ‘Alexa, add toilet paper.’ Alexa is great at taking down your shopping/grocery list notes, that are then easily accessible from your phone when you’re on the go. I mentioned smart TVs. We’ve got a few of them and one of the first things Mike did when we brought Alexa home was hook her up to the smart TVs. Asking Alexa to turn on and off the TV is a pretty common request in our house. TELUS has an Alexa Skill that lets you hook up your account and do things like calling certain contacts you program in (like mom and dad), or even check your data usage if you feel like you might be getting close to going over. It’s pretty handy! As a huge fan of escape rooms, I was excited to learn there was an audio escape room Skill you could play with Alexa. Mike and I have tried a few of the rooms and have been unsuccessful at all of them. Audio escape rooms are really challenging! It’s fun but really hard. Okay this one is a little silly but we’re big fans of Pokemon in this household so when Mike found out you can ‘activate’ a Pikachu voice through Alexa, he obviously enabled that skill. We don’t use it often, but it’s proven to be a fun party trick, and our niece and nephew love it lol. Did you know I record a monthly social media podcast with my friend Tyler? Well I do! And now you can listen to it by enabling the AnyPod podcast Skill, then asking Alexa to play Don’t Call Me a Guru! Fun!! Also maybe at this point you would say ‘Alexa Volume 3’ because my laugh gets pretty loud. OK, this one is kind of cheating so I could get to 10 Skills on this list (lol). We don’t actually have smart lights enabled in our home so this doesn’t quite work yet, but we fully intend on switching to smart lights so Alexa can help us with turning those on and off too! For those who do have smart lights, this would definitely be one of your top Alexa skills! Now that you’ve read about some of the fun skills Alexa has (and even more Alexa skills are coming!! 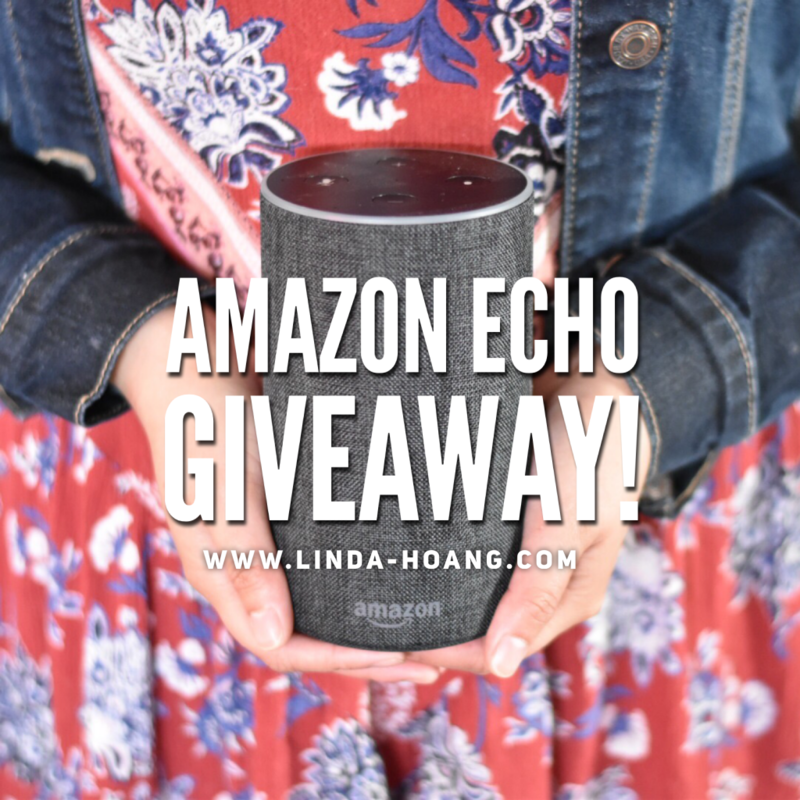 ), enter to win an Echo and try out Alexa for yourself! Share my Amazon Echo blog! Enter to win an Amazon Echo. Leave a comment on this blog post sharing with me why you want a smart home assistant. If you have a smart assistant already, let me know what your favourite skills are! Leave a comment on my Facebook Page post, tagging a friend to spread the word about my giveaway! Leave a comment on my Instagram post, tagging a friend to spread the word about my giveaway! Comments are moderated so if yours doesn’t appear right away that’s normal! Winner will be randomly selected by May 13, 2018. You must be a resident of Canada to be eligible to win. ** UPDATE ** Congrats to the randomly selected winner – Chelsea L.! Thank you everyone who entered!! P.S. My friend and fellow Edmonton blogger Mack recently did a post comparing the Google Home with the Amazon Echo! Read it here if you’re looking for even more details on smart home assistants! Disclaimer: I will always provide my 100% honest opinion on this blog. This blog was posted as part of my #TeamTELUS brand ambassador partnership. I’m a proud member of #TeamTELUS! This has no impact on opinions stated in this post. I recently moved into my new home and I’ve been looking to buy a smart home assistant. I have already bought a smart lock and switches. I was comparing market opinions of the google mini and the Amazon Echo so this giveaway is the ideal opportunity to win something that I actually need for my home :) The blog post was very interesting and I’m looking forward to acquiring a smart home assistant for my house! I would love to own a smart home assistant so someone can help me with my kids’ questions. I use Amazon a lot, so it would be great to have Alexa to help order items. Also, music. Yes. Dance party. Yes. The escape room is intriguing? As long as there’s no laughing. We would love to get a smart lock for our front door so we arent fumbling for keys! Asking an assistant to lock and unlock the door would be smart! I would love to have an Alexa because my husband is totally into new tech gadgets and he would have so much fun with it! I would use the Echo as a virtual music assistant. Hands free Spotify from now on! To help me turn them off. I think it could make this working mom of 2 (one furry and 1 human) / teacher’s life easier! Thanks… plus we both have wicked names! My 18 year old son just bought a Google Home for his room a few weeks ago. At first I thought it was silly and unnecessary but now I’m a bit jealous. I would mostly use an Amazon Echo for music and shopping lists. This could be an amazing prize! Another new gadget to have fun with! Thanks for the opportunity! I’d make very good use of the list portion and probably the music playing ability aswell. My house is not smart! Winning this would be an awesome way to get started smartening up my home! I think she’d also be useful with a smart thermostat! I’ve seen it used in that application and it’s so amazing! I would love it for the grocery list feature alone! Inalwayd think of things to add then forget immediately. The music would be nice as well I like having some tunes while cooking or cleaning. I would love to make our home “smarter” and surprise my husband as he’s been wanting one. This would’ve amazing for music on Spotify! I want to win because it seems like everyone else has one but me! I’d use Alexa as my personal assistant (For business) to keep me organized and also a super awesome speaker! Ask stupid questions and listen to music!! I would love to win an Alexa for so many of the reasons you listed above, that I had no idea about! The grocery list feature is totally #1, but asking for her to play Backstreet Boys (and other boy bands) is definitely right near the top ;). Have you been listening to Pepper and Dylan’s daily boy band countdown?? We are working on making our home more smart, so this would definitely help! My new dmart thermostat is Alexa compatable. Woulf love to team them up to help conserve power and save money! That would be so incredibly handy! I would love to be hands-free while I’m in the kitchen, doing laundry… pumping those tunes! I would love to win the Amazon Echo for my parents to make their daily activities just a little more convenient and/or funner! Life is busy. We recently updated our home to somewhat of a smarthome. Therefore the tv just shuts off right in the middle of a show. I want an amazon Echo so I can quickly get the tv back on. It would be so fun to get this to do so many things for us. Thanks for the chance! I have yet to try anything ‘SMART’ for our home but I would love to try the Amazon Echo as a start! 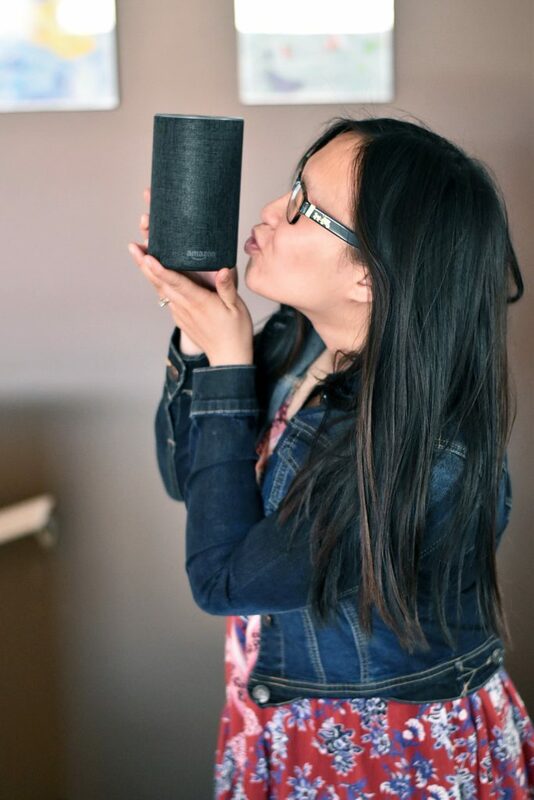 My girlfriend has this device (or similar) and we turned Alexa into our DJ at one of our last gatherings. It was cool to see her find all the old school songs requested and hear her responses when we weren’t clear. I would love to try the Amazon Echo out! I would love to have a smart assistant at home. The shopping list one would be key! Plus playing music while I’m baking would be nice too! Definitely to try out the pikachu talk! Being able to play music hands-free and add to my grocery list while in the kitchen would be awesome! I want this smart home assistant because it would make life so much easier, being able to get news and sports scores instantly would be amazing! Woah woah…. connect to Spotify?! 👀👀 if I don’t win. I’m totally buying this. My husband has literally asked me everyday about getting this and I have always said no because I thought it would be more creepy than helpful honestly. But I just read more about it and definitely need one ASAP. We also order from amazon very often and I like that I could just say what I want to order! I’m so intrigued about the escape room! I wanna try that!! I think it would make my life easier! I wouldn’t have to get up to turn the lights off when I am almost sleeping! I’ve heard about Google Home and Amazon Echo/Alexa. As curious as I have been, I’ve been reluctant to go out and buy one simply because I’m thinking “do I really need another gadget in my house?” But after reading your blog, I’m more curious then ever! I’m a mom of two littles so anything that can help with day-to-day routines is definitely something worth considering! Since starting my business and now working g from home, technology has become so important for productivity and efficiency, would love the assistant to help me with Nimble!! I would love an echo so my wife and kids would have a new toy to play with so I could watch some playoff hockey in peace and quiet!!! I love the idea of asking for news highlights! Another feature I would definitely try out is listening to podcasts (like The Current-CBC) to make cleaning my house more bearable. Ooh ooh pick me! Alexa would definitely be useful when you’re in the middle of cooking or something and want to change the music or skip to the next song! I have a google home mini and I use it so much for cooking! It does conversions, sets timers and helps me out a ton in the kitchen. I’ve heard so much about Alexa and this would help me so much being hands free with cooking, crafting, music, scheduling for my small business.. endless possibilities! I do not have a smart home assistant, but my friend does & it’s awesome being able to turn the lights on when your hands are filled with groceries! I think it would be interesting to give Alexa a try – kind of scary to have something listening to me all the time which is probably why I hesitate getting one but I do see how convenient and helpful it could be! Once I try it I think I could become addicted to it! I want a smart home assistant because it looks so cool and handy and I would love to try one out! Hi Linda! I would really like an Amazon Echo because I am very interested in creating Alexa Skills but, unfortunatley, I can’t really test the skills out because I don’t actually have an echo. I know there is an online simulator but it’s just not the same as actually having the hardware. Also, I recently learned about a contest by Amazon to win $25000 for building an Alexa skill, and I could really use the money to pay for my tutition (I am an undergraduate student). I would love to get this to convince my family that we should make our home smarter! An echo could be the operactions centre of my smart home, I would love to start adding smart lights and plugs, etc and control them using an Echo.